Mayonnaise is one of those food items that I have a dislike/hate relationship with. Over the years, I’ve hoped it would change but it hasn’t. The smell of a knife having been used to spread mayo and left in the kitchen sink makes my stomach turn. I can’t stand the way it makes bread all spongy or the sight of oozy white stuff in tuna or chicken salad*. Mayo on fries, don’t even get me started on how repulsive that is to me. That’s probably a bit surprising as I like other gooey white food products: yogurt, sour cream, crème fraîche, double cream (mmmm…w/ scones please). Mayonnaise and I have just never hit it off. For some reason, though, this summer, when the tomatoes were at their peak, I decided I wanted to see if I could change that. I decided that maybe if I made my own mayonnaise, I might actually like it. As you may have read on the previous blog, I went a bit tomato crazy in August. It’s just so hard not to, with such gorgeous specimens available. And the flavors are amazing. I decided that the showcase for this, using only Greenmarket produce, would be a BLT. Again, baring my soul to you, dear readers, I have to confess, I’ve never liked BLTs. It is another one of those things that I can only put down to food finickiness on my part. I’m not a big fan of supermarket-type white bread (strike one), iceberg lettuce isn’t my favorite either (strike two), and then there’s the tomato issue (yer out). With tomatoes that taste like packing foam, and then the addition of the loathed mayonnaise to boot, it’s not a shock that this sandwich was on my “to-be-avoided-at-all-costs” list. I looked up a few recipes, read a few sets of instructions, and thought, “I can do this, easy-peasy.” Well, it wasn’t so simple. I couldn’t seem to get it to emulsify (or gel as a non-cooking term). Like hollandaise, which I can make in a snap, mayonnaise takes several ingredients liquid and solid and carefully, scientifically blends them in a precise method to make something else. Twice, I tried this and was left with a golden, liquidy mess. How could this be? After the first attempt, I read up some more about the process on line. (The great thing about the Internet is that it has masses of information that might seem useless until the day you want to find out while your mayonnaise has flopped.) So, I started it again, this time, making extra sure to incorporate the oil drop by drop, as instructed. I vigorously whisked the ingredients, as that was also highlighted as a possible point of failure. It failed. I was starting to take this personally. It is a condiment, for heaven’s sake. How can I be beaten by a condiment? And one that I don’t even really like but find one of those vile necessities in life, like having blood drawn. In my frustration and growing hunger, I decided to put together a BBLT. 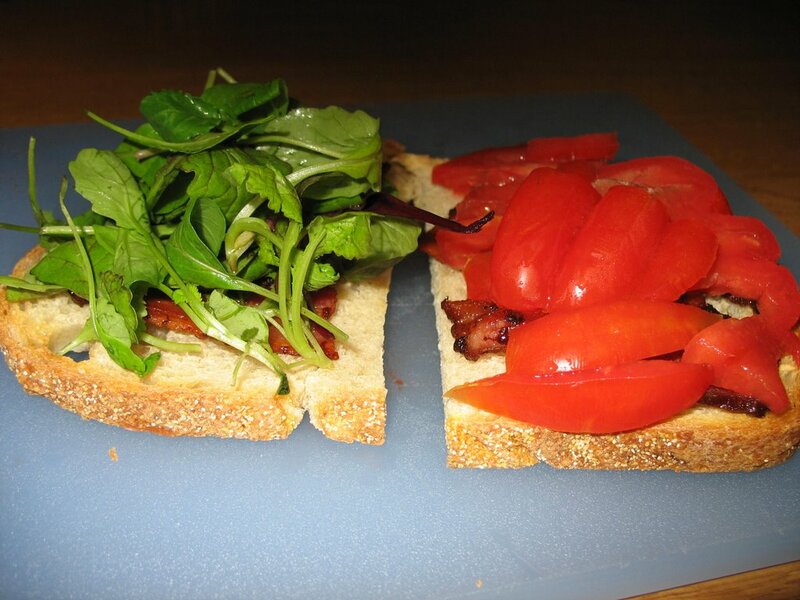 Yes, that’s not a typo, I made a Bacon-Bacon-Lettuce-and-Tomato sandwich, on toasted farmer’s market bread, of course. After all the vigorous whisking of the mayonnaise for naught, I decided that I could then transfer the unused saturated fat calories into extra bacon. I’m sure that my physician thinks differently, but as my cholesterol level was very good in my blood test a month ago, I figure that I have almost a whole ‘nother year to go before I have to worry about that again. Besides, I didn’t give the doctor my URL. Then, I did what any self-respecting cook does. I called my mother for her advice. “Sure, I have,” she said. “arghh, I can’t get it to work,” I responded. [sigh] My mom is a great cook. I’ve learned lots at her side. On occasion, we have even cooked together, especially when she visits me in New York where there’s also great shopping that goes along with the cooking. I was not surprised to hear that she’s successfully made mayonnaise. I felt even more defeated after talking to her. It should be so simple. I know the basic principle behind it, but, like in my high school chemistry experiments, sometimes knowing what it should do and actually being able to replicate the results are two different things. So, on her visit up here during the holiday weekend, she watched me make mayonnaise again. It sort of worked. We ended up adding too much oil and the sauce started to separate. I decided to give up the ghost at that point. Maybe mayonnaise and I were just not to be. I cooked the bacon in a Lodge (www.lodgemfg.com) cast-iron pan that I received as a Christmas present a couple of years back. Cooking with this pan is better than lifting weights. The handle of it also gets very, very hot. When shopping at a kitchen store in Florida, I found the answer to my solution: a Flameguard handle holder. What’s even cooler is that they come in several different colors and they don’t cost the earth. It’s nice to find an easy way to avoid searing one’s hand on a hot handle and it has made several previously pain-in-the-neck pans more useable. A search on Google™ came up with several places from which you can order them. 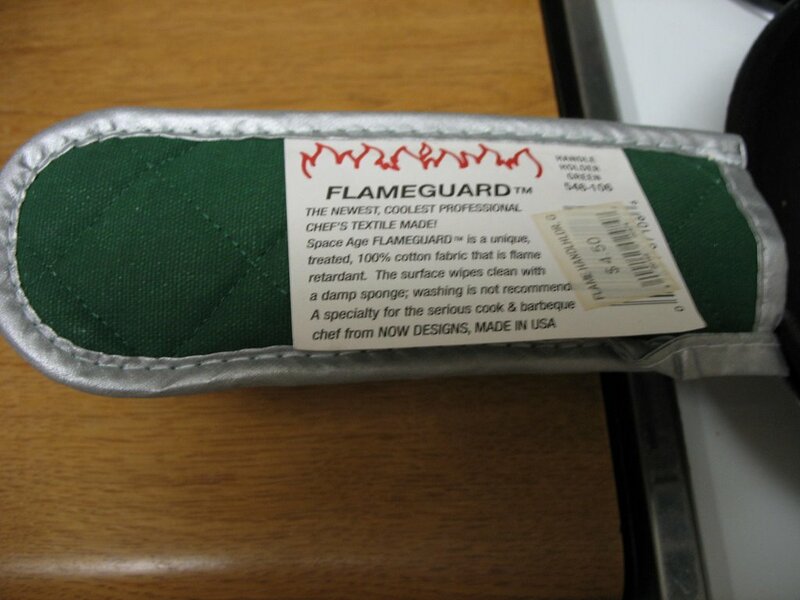 Just type in “Flameguard” in quotes, as it’s a brand name. Unfortunately, I did not see them on the website for the store where I originally bought mine. The Brits have this right, call the gloppy mixture what it is: x mayonnaise. I give them props for this. We will, however, have to have a serious discussion at some stage about why when you order a sandwich, they have all the bread pre-spread with butter, even before lettuce or meat or cheese goes on it. That is seriously gross and potentially clashes with anything else that might go on the bread. 1st…of course you don’t like mayo, because we all know miracle whip is better!! mmm….yeah, I decided that the BLT needs really fresh, seasonal, organic ingredients. Not sure how it would go with Miracle Whip. Wouldn’t that spoil the whole thing? No matter how much of a fan I’m not of mayo, I’m not converting.